The Bavarian Military Commemorative for 1813, 1814, and 1815 (Militärdenkzeichen für 1813, 1814, und 1815) was founded on December 4, 1814 by King Maxmilian Joseph I. for all, “on the payroll of the mobilized army in the years 1813 and 1814, or who were recorded in only one of them and are counted under the number of the combatants.” It was initially awarded only to all participants of the wars of 1813 and 1814. It was subsequently, under the Decree of March 27, 1817, also awarded for the war year 1815. With the exception of Senior Commander, Prince Wrede (died 1837), all combatants received the same commemorative from the General to the common man. The crosses were awarded on May 27, 1817, and also in 1818. 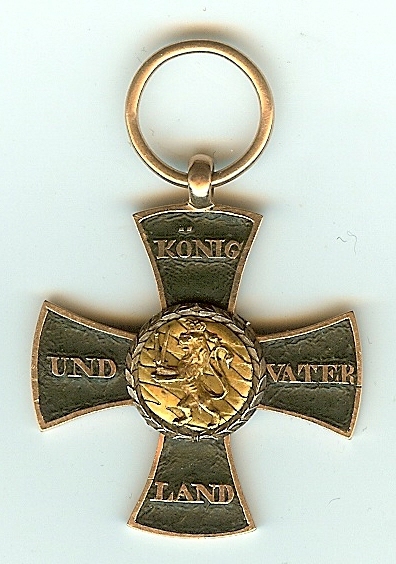 The awarded crosses were struck in bronze. During the finishing process, the cross arm and center edges were then ground as were the raised edge surfaces and inscription areas of the cross arms. Finally, a thick bronze eyelet was fused to the top of the cross. Through this eyelet passed the ribbon ring which was then fused. 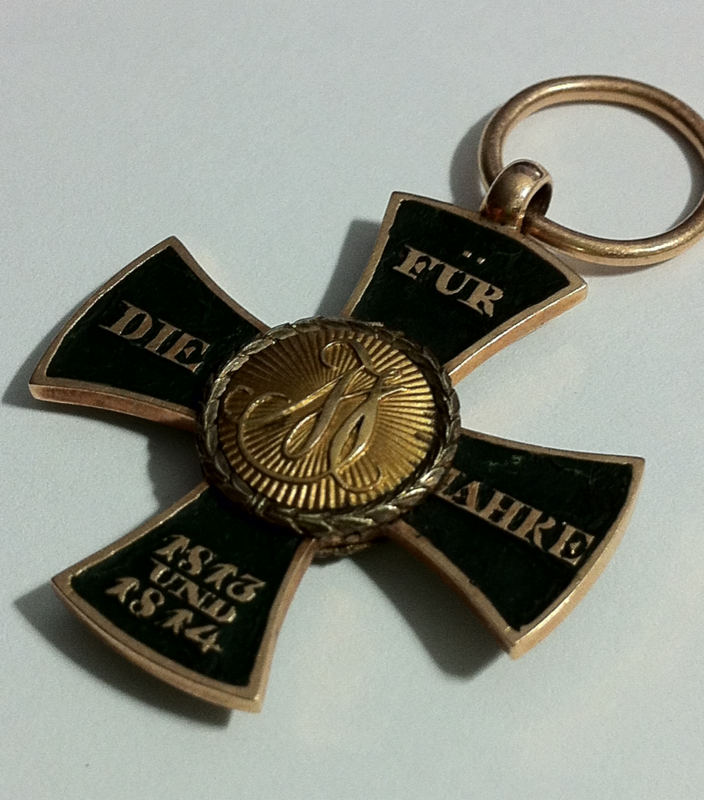 The awarded cross had rounded arms, whose relief areas are covered with a black-green (schwarzgrünen) colored lacquer, while the raised edges and inscriptions emerge in bright bronze. The obverse of the award had a 14mm diameter middle-shield, with a narrow dense thread of laurel surrounding, the intricate signature “M J”. On the four cross arms are distributed: “FÜR” (above), “DIE” (left), “JAHRE” (right), “1813 / UND / 1814” (under), (“For the years 1813 and 1814”). The reverse of the award has a narrow dense thread of laurel surrounding, on a lozenge-patterned-base, a leftward-stepping Royal-Crowned lion holding a scepter and sword. 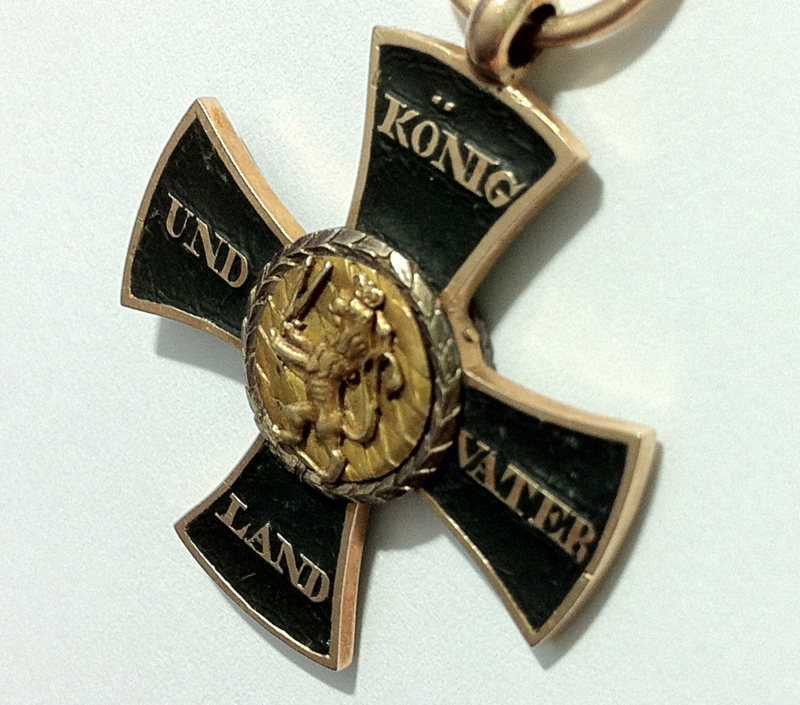 On the four cross arms are distributed: “KÖNIG” (above) “UND” (left) “VATER” (right) “LAND” (under), (“King and Fatherland”). The awarded crosses were 32 mm in size. The ribbon was 35 mm wide, white with 2 sky-blue, each 4.3 mm wide, and subsequent to the outside black, each 3.5 mm wide side stripes, and on each side 2 mm wide sky-blue edges. Field Marshal Prince von Wrede, as the Army Commander, received “because of his diverse merit to his Majesty’s Royal House and people” a specially designated Commemorative, which he wore on the proper ribbon around the neck. The neck-cross for Field Marshal Prince Wrede was approximately 60mm in size and its raised areas were heavily gilded, it was otherwise of the same design and form like the other Military Commemoratives. The special cross which was awarded to Field Marshal Prince von Wrede was at his Schloß Ellingen estate until it was lost in 1945. A more precise description is therefore no longer possible. It was sometimes the case, as seen by surviving examples, that crosses were gold-plated and then the relief areas of the cross arms were coated black or dark green. These pieces did not oxidize and therefore remained bright looking during normal wear. They therefore did not need to be polished to stay bright. It is likely that such pieces were ordered by Officers, as such work was undoubtedly relatively expensive. The awarded pieces however could oxidize naturally to a dark color over time. Figure 1: Custom-made cross and ribbon. Image from author’s archive. A very interesting custom-made example of this award has come to light. The piece in question has components which are all made of gold. The cross body was hand-cut in relief to form the raised edges and inscriptions. The relief areas are coated with a black lacquer. The cross body is 28 mm high and 28 mm wide. At the top of the cross is an eyelet through which passes a fused gold ribbon ring. 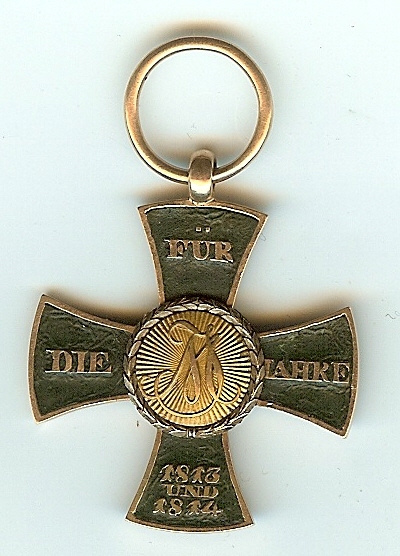 Figure 2: Obverse of the custom-made cross. Image from author’s archive. Figure 3: Reverse of the custom-made cross. Image from author’s archive. The center pieces are pinned to the cross body with two pins. The centers are approximately 10 mm wide, and including the surrounding lesser-gold content alloy laurel wreaths, they are 12mm wide. The obverse center has a die-struck “MJ” monogram surrounded by a separate laurel wreath. The reverse center has a separate leftward-stepping Royal Crowned lion holding a scepter and sword fixed to the die-struck lozenge-patterned-base. The surrounding laurel wreath is also a separate piece on this side. Figure 4: Detail of the obverse of the custom-made cross. Image from author’s archive. Figure 5: Detail of the reverse of the custom-made cross. Image from author’s archive. The quality of workmanship displayed in the manufacture of this piece is on par with the best known examples of Orders from the period. This piece was undoubtedly commissioned by an Officer. Such work would have been expensive to commission and the Officer who wore this example was certainly an Officer of some prominence. No other similar examples of this award are known to exist. Thank you for your interest regarding this unusual example of this award. Comments are welcome. Hessenthal, Waldemar Hesse Edlen von und Schreiber, Georg. Die tragbaren Ehrenzeichen des Deutschen Reiches. Verlag Uniformen-Markt Otto Dietrich. Berlin, 1940. Heyden, Hermann von. Ehren-Zeichen (Kriegs-Denkzeichen, Verdienst- und Dienstalters-Zeichen) der erloschenen und blühen- den Staaten Deutschlands und Österreich-Ungarns. Kommissions-Verlag von Brückner & Renner, Herzogl. Hofbuchhandlung. Meiningen, 1897. Schreiber, Georg. Die Bayerischen Orden und Ehrenzeichen. Prestel Verlag. München, 1964. What a beautiful piece. Very special considering the cost that went in to create it during that time.